Well I've been pinching pennies for awhile. It's a little difficult when you are a consistently broke EMT I finally have my thuren springs, overland shocks, sway bar end links, track bar, carli arms, and synergy leaf shackles. So my next step is to finally get the thuren kings ive been drooling over for the past 6 months. I plan on getting the 2.5's front and rear with the rear optioned with the standard bypass system. My question is what stage is everyone using? I dont plan on jumping the truck but I would like to cruise down backroads and single track at a pretty good clip. In my research so far, going with stage 3 in the front and stage 2's in the rear along with the bypasses seems like the way to go. I'll consult don thuren as well but as always you guys tend to be chock full of info so any insight would be great! My friend who was an Engineer for King put it best. "What we found was that improving the suspension of any vehicle almost never improves the ride quality. It just lets people go faster until they reach the same point of human discomfort." If your driving style is fixed, i.e. street driving, then quality shocks makes it smoother. Since your driving style leads you off road, his information applies. Bigger is always better, and it's much easier to swallow the price tag and be happy than to wonder what you could have had when you already paid 80% of the cost of a full blown system. You already did it right doing the supporting goodies first. I would really suggest that you make the most of those shocks though. When we met I remember thinking you had an issue with your foot being duct taped to the throttle pedal, so going with stage 4 isn't a bad idea . Bypasses in the back opens up an opportunity. I have very stiff valving in mine but it rides quite smooth because of the bypass zone. I would suggest going with a stiffer valving in the rear. This will keep the same street ride as a softer valved smoothie while adding a lot of bottom-out resistance. There are two huge things to consider here, no matter whose opinion it is. 1: quality shocks are awesome. Even 2.5 smoothies are excellent and very capable. Cost of suspension improvement is exponential in comparison to linear gains. 2: As long as you are painfully honest with yourself and your needs, Don is going to give you a far better opinion than anyone else can. These types of threads are almost useless because of it. Even if the feel of the shocks isn't what you think you needed, if you were honest with Don he is going to suggest to you what is going to be the best fit. Exactly. Thats why I have no problem rocking my factory Bilsteins. I hardly ever go bajaing through dunes or hard washboard roads. Usually just slow wheeling and two tracking type stuff. And where i use my truck the most, getting groceries and going to the mall, the damn thing rides like a caddy already IMO. My Bilsteins rode smoother than my Kings. I have stage 3 Kings and they are not any smoother than Bilsteins at 30mph. They are night and day better driving 50mph over gravel roads though. Reloaderguy wrote: I have stage 3 Kings and they are not any smoother than Bilsteins at 30mph. They are night and day better driving 50mph over gravel roads though. What about on twisty paved roads? Improve handling/body lean? You will see a huge improvement in handling. Much more sporty and controlled. Last weekend we were in the Mojave and holding 50-60mph through turns in sand washes like the truck was on rails. 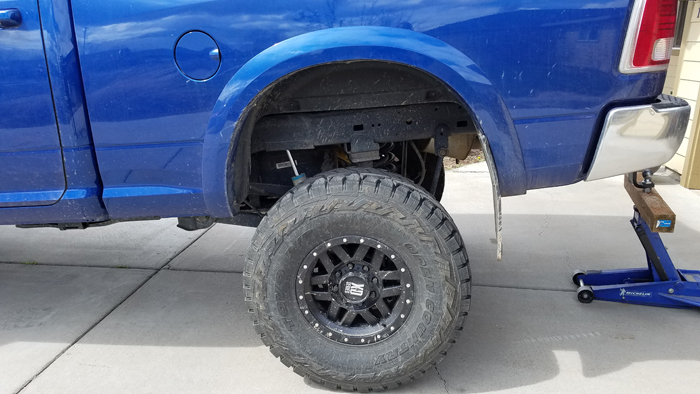 It's a 3/4 ton truck with a 3" lift on 37" tires. Nothing will change that. Admittedly 90% of my driving is on the road since it is my daily. If i could keep the ride the same as it is now with the overlands or even just a hair firmer while increasing my offroad speed potential I would be happy. Sounds like Stage 2. Again, we are just goons. Don is going to answer this question outright, and a lot better than we can. thedriver21 wrote: Admittedly 90% of my driving is on the road since it is my daily. If i could keep the ride the same as it is now with the overlands or even just a hair firmer while increasing my offroad speed potential I would be happy. I haven't driven on the Stage 2 so I can't tell you exactly what they feel like but I initially ordered Stage 2. I changed my order to Stage 3 when I read reviews of guys blowing through the Stage 2 travel on the street. I think Stage 2 is going to feel floaty and plush, possibly to a fault. Stage 3 is definitely responsive on the street, slightly too firm but better than too soft. I plan on ordering stage 1, but I baby my truck in the rough and have never even bottomed the Bilsteins. If it ends up being too soft it's no big deal to change the valving on my own. Has anybody ordered the extended travel rears? Is it worth the upgrade if you never leave the ground, any change in articulation? Chromolykid wrote: I plan on ordering stage 1, but I baby my truck in the rough and have never even bottomed the Bilsteins. If it ends up being too soft it's no big deal to change the valving on my own. Has anybody ordered the extended travel rears? Is it worth the upgrade if you never leave the ground, any change in articulation? How much droop do you want. This is the standard 2.5 King and there is still more travel to go. Even with the standard travel, you will have to either lower your cross member or use limiting straps. This is with the cross member lowered 1" and the tires still touching the ground mostly drooped. Good tip! That would be expensive to learn the hard way, thanks for the info. Looks like the standard travel shocks get more than enough anyways. I have stage 3 up front and 2 rear. I also did the extended travel. I know when I lift the rear of the truck I hit the cross member. I don't jump things but I will lower it at some point. I've been happy so far. No bottoming out. I'm a slower driver offroad, but didn't want to totally limit what I could do. My only issue continues to be chatter from the rear shocks. Chatter (felt vibration) or clatter (sound) from rear shocks? Highly technical terms haha. You were hearing your bypasses correct? Have you asked him if the bypass valves are rubber coated or bare steel? The race valves are bare steel and last longer. The performance valves are rubber coated and are almost silent. I have a question for anyone with kings, im thinking of upgrading, I have Dons Overland front springs/shocks now, rear is stock. On slower rutted out rocky trails like we have here in AZ the 3/4 ton suspension beats me to death so to speak I have to go much slower that Jeeps that I see... will the Kings improve this as far as softening the Jar ? I dont see myself bombing trails with a trussed axle, I am thinking of it more for slower trails and just wondering if its worth it ? Yes, Kings will make a big change. You don't need big shocks, but just being able to control the valving will make a big difference. For rock crawling I think a soft compression and stiff rebound valving would do you wonders. I know what you mean by getting beat up. Kings will take care of the body movement, but going to Kings means you will need to rely more on lowering tire pressures to get rid of the little chop. You might be able to get a good ride anyways if you generally go with the low compression valving though. Do it! Marcus... going to need you to school me on suspension options in Moab! aearles wrote: Marcus... going to need you to school me on suspension options in Moab! DamageWagon wrote: Yes, Kings will make a big change. You don't need big shocks, but just being able to control the valving will make a big difference. For rock crawling I think a soft compression and stiff rebound valving would do you wonders. I know what you mean by getting beat up. Kings will take care of the body movement, but going to Kings means you will need to rely more on lowering tire pressures to get rid of the little chop. You might be able to get a good ride anyways if you generally go with the low compression valving though. Do it! Thanks for the Info!! Makes sense. I'll throw my 2 cents in here. Just recently finally got my 3.0 stage 6s installed. Still in the process of getting the bypasses dialed in...and admittedly haven't really gotten it in the dirt yet.. I will say Don's description of ride feel on his site is pretty spot on.